Our Love Story - Engaged! To read the previous chapters of our love story, visit part I, part II, or part III. In the fall of 2007, we'd been together for a little over year. We loved spending as much time together as possible, and loved learning more about each other through late-into-the-night phone calls. There were no red flags popping up and each of us felt really positive about where our relationship was heading. Also, my (Melaina’s) internship at the church in Austin was coming to a close and I was looking at enrolling in seminary. Jason was finishing up his undergrad degree at Texas State. All of this led to the "hypothetical future" conversations every long-term relationship couple eventually begins having. Most of the conversations stayed pretty broad, but sometimes things got specific. However, it wasn’t until one very specific conversation that I began to realize getting engaged was going to happen sooner rather than later. We had spent the day at the beach and we’re driving back. It was a long drive and we would ask each other questions to fill the time. The questions were often random, but when it was Jason’s turn he surprised me by asking what size ring I wore on my left ring finger. He asked a few follow up questions about preferences I had for engagement rings, and then the conversation moved on to other things. I tried to play it cool, but I knew something big had just happened. All the hypothetical marriage questions were just vague daydreaming about the future. But to ask about ring sizes and preference for cuts of diamonds? I knew this meant he was beginning to shop for rings. Here’s the thing about knowing your boyfriend's going to propose soon while simultaneously not wanting to ruin the surprise of it all...you start thinking through all the possible days he could propose, but keep it to yourself because you don’t want know exactly when it’s coming. As we moved more into fall and then winter, I saw so many possible days that would be perfect for a proposal. The Marine Corp Ball, Thanksgiving holidays, Christmas Eve or Christmas, our official couple anniversary (Dec 30), New Year’s Eve, my birthday (Feb 3), or even Valentine’s Day. But after no proposal at the MC Ball, Thanksgiving or Christmas, and no other real specific marriage conversations, I started thinking maybe he’d propose later in the spring. I knew he didn’t want a long engagement, and we were both in our respective cities until the end of May anyway. So I went into our anniversary date on December 30th, 2007 thinking it would be a fun date night with Jason, and telling myself to not get my hopes up for a proposal. The date was a nice date, but nothing really out of the ordinary. (I learned later that Jason had specifically not done anything over the top on purpose because he knew I was beginning to suspect something.) We hung out at a coffee shop, we went out to dinner, typical date night in Austin for us. After dinner, Jason suggested we go walk around Zilker Park and see the large Christmas tree made of lights, since it was the place we had decided to be an “official” couple the year before. We stood under the tree, bundled in our jackets, hugging each other and talking about how much we loved spending time together. There was a lull in the conversation and Jason said he had to get some tissue out of his pocket. He reached into his pocket and felt around for a second, then came up empty handed saying he didn’t have any. This is totally unlike him! He has bad allergies and always has tissue in his pockets. (Seriously, ask him next time you see him in real life.) So the fact that he suddenly said, “Oh, nevermind, I don’t have any,” really threw me off. Instead I said, “Are you serious?! ?” And then proceeded to wave my hands around saying, “Oh my gosh!” I do think somewhere in there I squeaked out a “Yes!” But Jason did have to ask me if I could hold my hands still so he could put the ring on my finger. Obligatory pic taken by my mom in front of her fireplace the night we got engaged. And just like that, we were engaged. It was simple and sweet and totally us. After the proposal, we drove to my parent’s house to show the ring off to them and my siblings who were there. And we called Jason’s family to tell them the news. Because we both wanted to get married the coming summer, we busily got to planning our wedding...which is a whole different chapter to this story! To read the previous chapters of our love story, visit part I and part II. After graduating college, I (Melaina) worked as a ministry intern at our campus' Baptist student ministry. In spring of 2006 my internship was ending and I found myself in serious like with Jason. There were a lot of hints that maybe he felt the same way too...like how he wrote me an encouraging note for doing some ministry event, how he left my favorite candies on my desk for Valentine's Day, how he bought me Walk the Line after reading on my personal blog how much I had loved that movie. Now the rules at my ministry job discouraged an intern dating a student so a dating relationship wasn't possible yet. So as we headed into May I began counting down the few remaining days of my internship fully expecting him to ask me out as soon as it was over. But he didn't. He still hung out with my roommate and me a lot and did sweet things for me. But once it was officially okay for us to begin dating, we simply proceeded to act as we had been all year. Now it is very important at this moment in our story to clarify the reason Jason didn't ask me out right when my internship ended. He was a week out from leaving for his annual military training where he would be in Morocco for about 2 1/2 weeks. And he didn't think it was fair to ask me on a date and then say, "Well, see you in 3 weeks." Looking back, I believe it was a very rational and considerate thing to do. Yet, 2006 Melaina had no idea what was going on in Jason's head, and I spent those 3 weeks wondering if I had misread everything from him the whole year. When Jason returned he did ask me to lunch, but I wasn't sure if that counted as a date. Then a couple of weeks went by where we settled into our regular routine of hanging out with friends. Still unsure of what exactly was going on between us, I decided to pray about it. I asked God to make it obviously clear if Jason & I should be together, and that if Jason didn't make an obvious move soon I'd assume that was God telling me no. The very next day, Jason asked me out on a date to a movie. And that was our first official date. Selfie with an actual camera on one of our many dates to Zilker Park in Austin. As we moved into the dating chapters of our love story, two specific dates stand out as defining moments for us. Jason asked me to go for a walk with him in a local park, and we finally had an open conversation about what we were both thinking and feeling towards each other. We clarified we were in a dating relationship, though I was sort of hesitant to start calling each other boyfriend/girlfriend since we had been on maybe 3 dates at that point. I didn't want to make the relationship seem more serious than it was for him by telling everyone he was my boyfriend. (Does that even make sense? I'm obviously an over-thinker when it comes to this sort of stuff!) So I told him I'd leave it up to him when he wanted to move from "just dating" to "boyfriend and girlfriend." Christmas is my favorite time of year, and so before the season was over Jason took me on a date to see the the giant Christmas tree made of lights in Zilker Park. We had another one of those "defining the relationship" talks where we talked about commitment and what it meant to call each other "boyfriend" and "girlfriend." And then he told me he wanted to be with me only and asked me to be his official girlfriend. When we look back on those months of dating, it's filled with such sweet memories for us. I was working in Austin at the time, and he was still living in San Marcos. Between living in different cities and having crazy schedules, we didn't see each other as often as we would have liked. Yet we grew really good at communicating (FINALLY!) through phone calls, texts and handwritten notes (my favorite). And when we were together for dates, we explored Austin and tried almost every single coffee shop in the city! After a full year of getting to know the best coffeeshops in ATX, and getting to know one another on a very deep level over countless cups of coffee and phone calls that lasted for hours, it was December again. Zilker Park once again put up it's huge Christmas Tree. And Jason was preparing for another defining date in our relationship, one where he would ask me a very important question. Read the next chapter of Our Love Story, Engaged!, here. Every single one of our J&M Sweethearts are special to us. Seriously, we have been beyond blessed with some amazing couples who end up feeling more like friends. But these Sweethearts right here hold an extra special place in our hearts because the bride is Jason’s baby sister. All of Jason’s siblings lived not only in the same state, but the same area of Texas...until 2 years ago. That’s when Julie followed her adventurous heart and bestie, Morgan, to Asheville, North Carolina. While we were sad to see her go, because a 16+ hour car ride one-way to visit is no joke, we were excited for the adventure she was beginning. And what an adventure! Julie began attending a great church and got plugged into a small group she really loved. And there was this boy in the small group named Anthony. They began dating and we heard rumors things were getting serious, but we knew for sure when Julie brought Anthony home to Texas for Christmas. Because like I said before, a 16+ hour drive one-way is no joke, and spending Christmas with your girlfriend’s family is a big deal. Bless Anthony’s heart, he met and was asked a million questions by our entire family. But not only did he survive, he fit right in, like he was meant to be there all along. And as soon as they were back home in Asheville, Anthony made it official by proposing to Julie with one of the most romantic rings I’ve seen. As Julie and Anthony began planning their wedding, Julie called us one day and asked us if we would be her wedding photographers. We could not have been more honored. We recognize the significance of our role in telling the love story of each of our couples, but to be the permanent record-keeper of the intimate moments of your baby sister’s wedding? The honor is unreal. Their wedding was a family affair, with Jason’s other sister, Jenna, making all the bouquets, boutonnieres, floral arrangements, and even the chocolate cake for the bride and groom. Jenna’s husband, Brian, provided Julie and Anthony’s favorite beers from his brewery, BS Brewing. Anthony’s sister, Ashley, played and sang during the ceremony. And every single niece and nephew under the age of 10 was invited to be flower girls and ring bearers...and they all made it down the aisle! We could go on and on about this wedding. The way Anthony’s good friend who served as DJ was able to mix in DC Talk, old-school Whitney Houston, and club mixes to keep everyone on the dance floor. 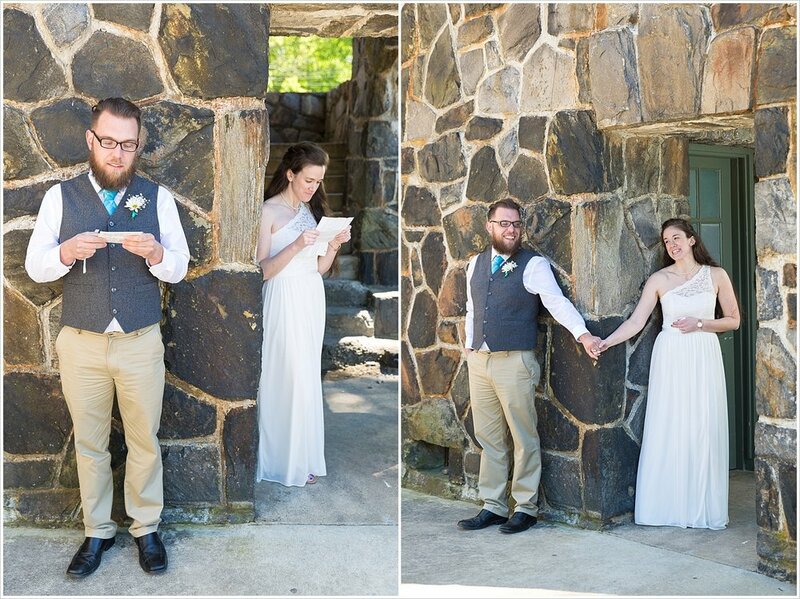 How friends from Asheville and Texas alike celebrated the couple and couldn’t wait to take selfies with them. 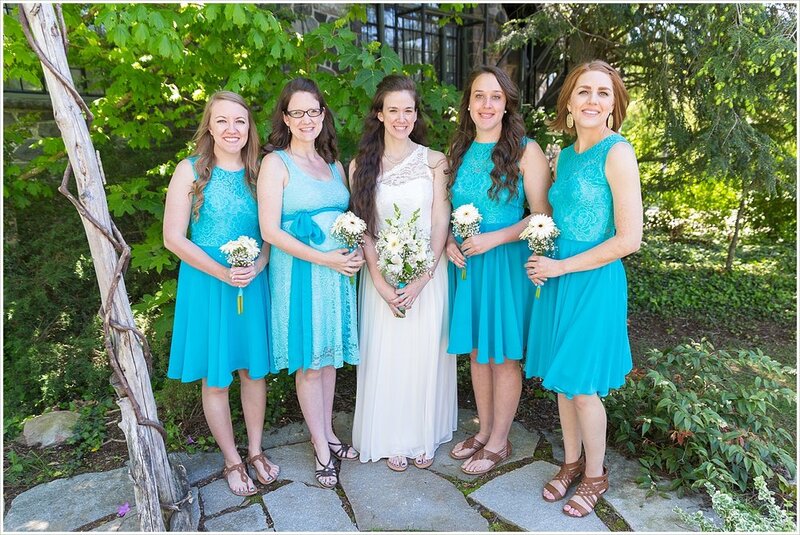 How the venue, Homewood, provided such a beautiful garden area for the ceremony and a gorgeous reception hall with wood flooring, a large stone fireplace, and large windows. (It was like getting married in a castle!) How Anthony & Julie’s wedding was romantic, beautiful, perfectly them, and just so fun! But maybe we’ll just let the images tell the story. What can we say? We love you both and are praying for such happiness and joy in your marriage. May your love grow deeper with each passing day, and may grace grow deeper still as you learn to be spouses to one another. We can't wait to see the adventures in store for you both. Want to learn more about becoming one of our J&M Sweethearts?